It’s hard to choose this week’s title, since I found quite a few nice songs in my library and also because I have been listening to lots of classical music to help me focus on studies. 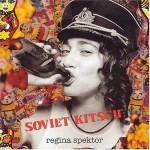 But for those not into classical music, I would recommend Us by Regina Spektor in her album Soviet Kitsch (Amazon Link). This song is also featured in the soundtrack of the movie 500 Days Of Summer (personally I find that the movie does not live up to the comedy part of a romance comedy, but I love the presentation of the movie). Even though I only discovered her recently, I love many of her songs, and you should really check out her songs if you are into this kind of alternative music. Oh, and I am really sorry for the lack of updates, but with 10 days to go my to the start of A levels, I really need to concentrate on my studies. I do not want to regret anything when I get back my results next March, no matter how badly or how well I did. I just want myself to know that I have put in my absolute best, even if it may not be enough to meet my parents or my own expectations. Wish me all the best.